This section provides a brief overview of this manual and an introduction to InfoSWMM and many of the modeling capabilities of the software. This manual is designed to engage students in a hands-on learning approach to stormwater and wastewater sewer system analysis. 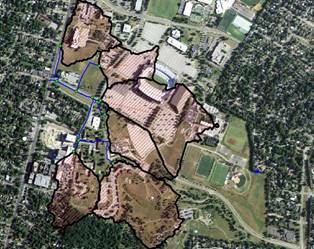 Students will discuss the fundamental theory behind stormwater and wastewater system analysis and how to apply it to design problems using the InfoSWMM software package developed by Innovyze. InfoSWMM offers DIRECT ArcGIS INTEGRATION enabling engineers and GIS professionals to work simultaneously on the same integrated platform. It allows the user to command powerful GIS analysis and hydraulic modeling in a single environment using a single dataset. 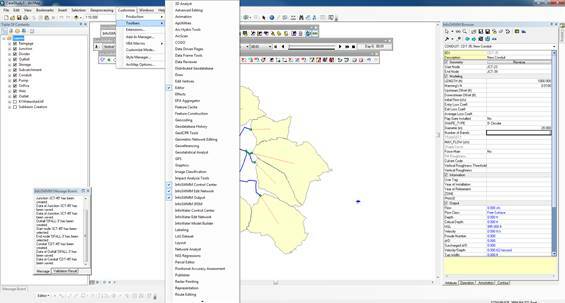 One can now create, edit, modify, run, map, analyze, design and optimize your sewer network models and instantly review, query, and display simulation results from within ArcGIS. Its unique interoperable geospatial framework enables world-record performance, scalability, reliability, functionality and flexibility – all within the powerful ArcGIS environment. 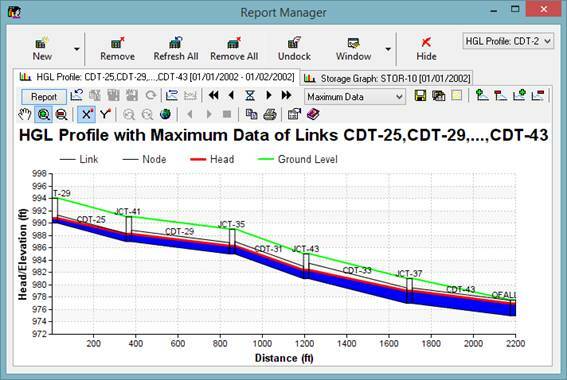 InfoSWMM is a fully dynamic, geospatial wastewater and stormwater modeling and management software application. InfoSWMM can be used to model the entire land phase of the hydrologic cycle as applied to urban stormwater and wastewater collection systems. The model can perform single event or long-term (continuous) rainfall-runoff simulations accounting for climate, soil, land use, and topographic conditions of the watershed. In addition to simulating runoff quantity, InfoSWMM can also predict runoff quality including buildup and washoff of pollutants from primarily urban watersheds. 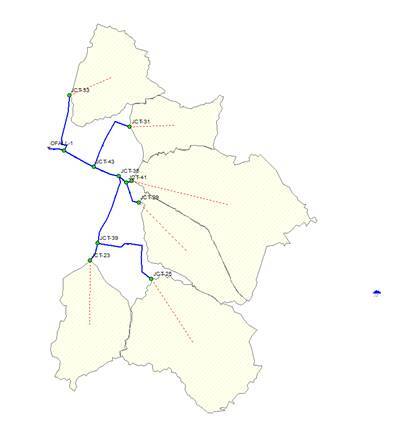 Once runoff quantity and quality is simulated, and wastewater loads at receiving junctions are determined, InfoSWMM routs (transports) the flow using either steady routing, kinematic wave routing or dynamic wave routing. The model is capable of routing through a conveyance system of pipes, channels, storage/treatment devices, pumps, and hydraulic regulators such as weirs and orifices. The model offers very advanced Real-Time Control (RTC) scheme for the operational management of hydraulic structures. InfoSWMM also supports a variety of specialized treatment plant control devices as well as river profiles resulting in an Integrated Catchment Management solution for modeling the sewer system, the receiving water and the wastewater treatment plant. InfoSWMM also serves as a robust platform for advanced modeling, operational issues, short-term, long-range and capital planning, urban stormwater treatment and analysis, and analytics-driven asset management extensions. Some of these critical applications include InfoSWMM 2D (two-dimensional surface flood modeling), CapPlan (risk-based capital planning and asset performance modeling), InfoSWMM Sustain (optimal selection and placement of LIDs/BMPs), InfoSWMM SFEM (dynamic sewer flow estimation model), InfoMaster (GIS-centric analytics-driven asset management), and RDII Analyst (rainfall-dependent inflow and infiltration planning and analysis). This section will introduce the main principles, theories, and equations governing flow through urban drainage systems. This includes equations to define flow in subcatchments, open channels, and closed conduits. Infiltration, head losses, and average flow velocity will also be discussed. In order to sufficiently understand and design urban drainage systems, it is first necessary to understand the general principles that govern flow characteristics for both hydraulic and hydrologic systems. Sanitary and storm sewer systems can generally be analyzed using the conservation laws of mass, energy, and momentum. The basic analysis can be accomplished with mass and momentum conservation principles. Innovyze strategically applies these principles to analyze Stormwater Management Models (SWMM). This equation assumes that the change in storage of the system is equal to zero. Therefore, by multiplying the velocity of a fluid traveling through a pipe/conduit times the cross-sectional area of the fluid (area of the pipe if that the system flows full), the flow of the fluid can be found. In most sewer systems the pipe does not flow full. Hence the flow can be found by multiplying the average velocity that the fluid travels with the cross sectional area of the fluid in the pipe. The average velocity can be found using either Chezy’s or Manning’s equation, which are discussed in section 2.2. The principle of conservation of energy states that the total energy at a certain location in a system equals the energy at a further point in a system plus the energy change due to losses (i.e, friction) or gains (i.e., pumps). This principle is derived from Newton’s second law of motion, or the Thermodynamic Laws. The conservation of energy states that energy can neither be created nor destroyed, but that it transfers from one form to another. During a large rain event a sewer system can experience surcharging flow. In this situation the sewer system is flowing full and energy losses must be accounted for. These energy losses are handled using extended Bernoulli’s, Darcy Weisbach, and Hazen-Williams equations as discussed in section 2.2. The principle of conservation of momentum states that the total momentum of a system is a constant. This is centered on Newton’s third law of equal and opposite reactions. Imagine a collision between fluid particles. In this collision the forces involved at the contact between the two particles are equal in magnitude and opposite in direction. Also, the time in which the two particles interact with each other must be equal. Since the forces are equal and opposite and the interaction time is equal, it follows that the impulses experienced by the two objects are also equal and opposite. Since the impulse experienced by an object is equal to the change in momentum of that object we can say that for this particle collision momentum is conserved. If the momentum lost by one object is gained by another object then the total amount is constant. This idea will be used later when the Saint-Venant equations are discussed. Energy can be expressed in two fundamental forms in InfoSWMM, potential and kinetic energy. Kinetic energy can be thought of as the energy of motion while potential energy can be through of as the potential for motion. In a fluid system kinetic energy comes from the velocity of the fluid. Potential energy comes for the elevation and pressure of the fluid. Energy can also be gained in a fluid from an external input, such as a pump. Energy can be lost due to friction, fitting, and valves. Bernoulli’s equation builds off the conservation of energy by defining these specific energy terms. In this equation energy is expressed as a head which has dimensions of length. This head is representative of a depth of water. Each term in Bernoulli’s equation is representative of a head. The three main heads are pressure, ; elevation, Zi ; and velocity, . To conserve energy within the system, head loss from friction or fittings, and head gain from pumps are included with their own terms HG and HL. In order to solve this equation, typically two points are analyzed. Flow and pressure monitoring devices such as manometers, pressure gages, Pitot tubes, and velocity doppler meters help to determine the energy at these points. Similarly, there are several simplifying conditions and assumptions that can be made pertaining to the energy equation at specific points that help to analyze a system. For example, water that is exposed to the atmosphere has zero gauge pressure. This means that when the sewer network is flowing under design capacity that the pressure head is equal to zero. When the sewer network is flowing over capacity (surcharging) the pressure head must be accounted for because the flow is pressurized. The energy grade line is a term that represents the summation of the pressure head, elevation head, and the velocity head. It represents the total amount of energy at a certain location in the system. Head gains and head losses can be quantified between two points by finding the difference in hydraulic grade line between the two points. Chezy’s formula describes the average velocity in an open channel assuming steady and turbulent flow. This equation results from equating the driving force due to the weight of the fluid on an incline to a resisting force at the channel boundary. Note in the equation below that the hydraulic radius R is defined as the cross sectional area of flow divided by the wetted perimeter of the flow. For a pipe which is just flowing full (not pressurized flow) this is equal to the radius of the pipe. Chezy’s equation can be derived from constituent conservation equations and basic principles. Manning’s Equation is similar, but it is semi-empirical, and hence has dependence on the units used in the problem. Manning’s equation in terms of velocity is given below. Note in the equation below that the hydraulic radius R is defined as the cross sectional area of flow divided by the wetted perimeter of the flow. For a pipe, which is flowing full, this is simply equal to the inner radius of the pipe. Manning’s n is an estimation of the roughness of the channel boundary, and hence represents resistance to flow. Given the similarities between Chezy’s and Manning’s equations, the Manning’s n value can be used to make an accepted estimation of Chezy’s C, or vice-versa. Manning’s n values are readily available from a variety of sources and are used when calculating flows in subcatchments, channels, and partially full pipes. A table of a few common n values can be seen in Table 2.2.1. When rainfall occurs on a watershed (or subcatchment) part of that water ends up running off and contributing as inflow to the sewer/drainage system. A portion of the total rainfall can be used by plants, evaporated back to the atmosphere, trapped on the surface, or infiltrated into the ground. The amount of the rainfall that actually contributes to the drainage system as runoff is referred to as rainfall excess. In order to determine rainfall excess contributed to a sewer system by a subcatchment, it is critical to quantify the infiltration, and hence subtract this from the total rainfall. Infiltration in a watershed occurs during rainfall events and consists of rainwater occupying pore spaces of the soil. A soil’s ability to store water is called infiltration capacity. During a storm, a soil’s infiltration capacity reduces in a logarithmic (decay) fashion as the pores fill up. Infiltration capacity is heavily dependent on the soil’s properties, specifically the hydraulic conductivity. Infiltration is quantified based on infiltration capacity (the rate at which the water soaks into the ground). While the rainfall intensity is less than infiltration capacity, then all of the rain infiltrates the soil and none is available for runoff to the drainage system. As the soil voids get filled and rain continues, the ground will eventually become saturated. Over time when the soil becomes saturated the infiltration capacity reaches constant value. If the rainfall intensity is greater than the infiltration capacity, then water will pool on the surface of the soil and start to runoff. The amount of water available for runoff is the difference between the intensity of the rainfall and the infiltration capacity. Because of the complex nature of the Richard’s Equation, analytical solutions are limited. Therefore several numerical and empirical approaches have been taken to quantify infiltration. These methods will be discussed in section 3.1. The flow of water throughout a watershed and the conduits of a sewer network is a distributed process. This means that the flow rate, velocity, and depth vary with space and time. The Saint-Venant equations describe one dimensional unsteady open channel flow while considering mass and momentum conservation. Despite a channel having a velocity distribution which varies with depth and width, the Saint Venant equations assume that the flow only varies in the streamwise direction. This sets up a one dimensional flow. The flow is assumed to vary gradually along the channel so that hydrostatic pressure prevails and vertical accelerations can be neglected. The streamwise direction of the channel is simplified to be a straight line, representing the distance along the channel. The bottom slope of the channel is assumed to be small and the channel bed is fixed. This assumes the effects of scour and deposition are trivial. It is assumed that Manning’s Equation can be used to describe resistance effects from the channel boundary. As the system is open to the atmosphere, the fluid is incompressible, hence a constant density throughout the flow. The two constituents of the Saint-Venant Equations, continuity and momentum, are discussed below. The continuity equation is derived from the conservation of mass which states that, for a system, the volume leaving the system subtracted from the volume entering the system is equal to the rate of change in volume of the system. The continuity equation is a more restrictive form of the law of conservation of mass. It states that mass will be conserved locally. In our case, mass will be conserved within an open channel control volume. The first term of the equation, , is equal to the change in flow with respect to a streamwise location in the channel. The second term, , is equal to the change in channel cross section with respect to time, and can be thought of as storage in the channel. The resultant force acting on a fluid element is equal to the rate of change in momentum. This resultant force can be split into component forces acting on the fluid element. These components are equal to momentum terms which are balanced by the rate of change of storage of momentum in a control volume. The component forces are the net pressure force, gravity force, friction force, drag force, and wind shear. The gravity force is associated with the mass of the fluid on an inclined plane. The friction force results from shear stress along the interface of the channel boundary and the fluid. The drag force occurs whenever there is an abrupt contraction or expansion of the channel which causes energy loss through turbulent eddies. The wind shear force is caused by frictional resistance of air against the free surface of the flow. The pressure force is the sum of the hydrostatic forces on the on the left and right side of the fluid element as well as the force exerted by the banks. The following is the nonconservative form of the momentum equation which neglects lateral inflow, wind shear, and eddy losses. This form is used by dynamic wave routing (discussed in section 3.3). The first term in the equation, , is the local acceleration term. This is easy enough to see because acceleration is defined as the change in velocity with respect to time. The second term, , is known as the convective acceleration term. Convective acceleration is the rate of change of flow velocity with respect to both the position along a path through the fluid as well as time. The next term, , is the pressure force term. The gravity and friction force terms are and , respectively. There are several ways to account for the frictional losses. The Darcy Weisbach Equation and Hazen Williams Equation are two widely accepted methods for quantifying frictional head loss in pipe flow. 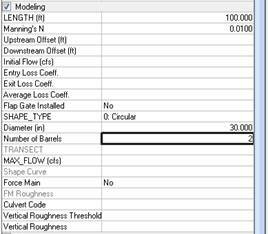 Both equations calculate head loss as a function of the fluid velocity, pipe length, diameter, and pipe roughness. The Darcy-Weisbach Equation quantifies frictional headless through pipe roughness. The pipe roughness is imbedded in the friction factor, f, which can be quantified by a variety of approaches (i.e. Moody Diagram, Colebrook-White Eq., Jain Eq., Wood Eq., etc.). Friction factors generally vary from 0.008 to 0.038. The Hazen Williams Equation is an empirical equation, hence the need for the units coefficient. Minor head loss coefficients vary for different types of bends, fittings, valves, etc., and are typically given by the manufacturer. Sewer systems are a series of man-made channels or conduits designed to remove unwanted stormwater or wastewater from human developments and areas surrounding them. Sanitary sewer systems convey greywater (i.e. water from the shower, dishwasher, etc.) and sewage (i.e. everything that goes down the toilet, including the occasional goldfish) from human residences and work places. Storm sewer systems on the other hand, convey storm runoff to a major river system which eventually carries the water all the way to the oceans. At the time many of these systems were designed, there were no wastewater treatment plants. Human sewage was discharged directly into streams. Since the sewage and the stormwater were both traveling to the same destination, it was much cheaper to build one system for both of them. This is why many sewer systems across the world were originally designed as Combined Sewer Systems (CSS) which carry both stormwater and sewage. As water quality became a more important concern, wastewater treatment plants were added to the systems to treat the waste before it was discharged into streams. To prevent backups (i.e. wastewater overflowing into the streets and houses through manholes), relief structures called “regulators” were added to the system. Regulators allow wastewater to overflow directly into streams, instead of streets and houses, during large storm events. About 40 million people in the United States are still serviced by CSS’s, according to the Environmental Protection Agency (EPA). Overflows from these systems have been labeled Combined Sewer Overflow’s (CSO’s), and it is now required by law that municipalities comply with water quality policies developed by the EPA, which include eliminating CSO’s. InfoSWMM is capable of modeling storm sewer systems and sanitary sewer systems separately, as well as combined sewer systems. When running a model in InfoSWMM, infiltration, runoff, and routing must be accounted for. InfoSWMM offers several modeling choices for each component. The infiltration methods are based on Horton’s equation, Green-Ampt equation, and the NRCS curve number method. Some runoff models include the NRCS triangular unit hydrograph, NRCS dimensionless unit hydrograph, and the EPA SWMM/nonlinear reservoir algorithm. The routing methods are based on steady-state, kinematic wave, and dynamic wave. In order to determine the amount of water that will be transmitted by a sewer system it is necessary to understand how the subbasin will respond to a rainfall event. This is heavily dependent on the amount of infiltration, which is dependent on the type of soil in the watershed as well as the land use of the area. The amount of water that is infiltrated does not contribute to runoff and will not need to be accounted for by the sewer system. Concepts behind the three infiltration modeling methods implemented by InfoSWMM are discussed below. Horton’s equation is one of the earliest to model infiltration. Horton observed that infiltration begins at an initial rate. This rate decreases exponentially with time until it reaches a constant rate. Horton’s infiltration model can also be derived from Richard’s equation, and is given here. The parameters and have no physical basis and are determined using experimental methods. A plot of this infiltration curve (red line) and a rainfall hyetograph (blue shading) is shown in Figure 3.1.1. Horton’s method assumes that the rainfall intensity is greater than the infiltration capacity, but this is not always the case. If the current intensity of the storm is less than the corresponding infiltration capacity the model must be adjusted to account for extra available storage. This effectively raises the infiltration capacity at the specified time. The adjusted infiltration curve is conceptually shown in the figure (blue line). While solving Horton’s equation for an exact solution is great, it is not always the best method for modeling infiltration within a watershed. Green and Ampt developed an approximate physical theory which has an exact analytical solution. This model is derived from the continuity equation as well as a Darcy’s law approach to momentum. Below is the equation which defines the model. This equation can be solved using a successive substitution method by assuming a value of F(t) at time t on the right hand side (RHS) of the equation. To apply this method the RHS is evaluated using the assumed value to obtain F(t) on the left hand side (LHS) of the equation. This LHS value is then substituted back into the RHS as F(t), and the RHS expression is evaluated again. This process repeats until the LHS F(t) and the RHS F(t) converge, meaning, they are approximately equal. This process is repeated for successive time steps through the duration of a watershed response. Application of the Green-Ampt model requires an estimation of the hydraulic conductivity of the soil, the porosity, as well as the wetting front suction head. This estimation was performed for thousands of soil horizons across the US by Rawls, Brakensiek, and Miller in 1983. Table 3.1.1 below shows a few common Green-Ampt infiltration parameters. The Natural Resource Conservation Service (NRCS) developed a method to compute the direct runoff resulting from a rainfall storm by studying the infiltration behavior of different types of soils. The NRCS found that the many factors affecting infiltration could be narrowed down to just a handful for approximate results. These factors are hydrologic soil group, type of land cover, and cropping practices. Soils are hydrologically divided into four groups on the basis of intake of water on bare soil when wetted. The type of land cover established runoff potential. Bare soil, vegetation, and impervious surfaces all have a different potential for runoff. Generally, urbanization increases the potential for runoff. Antecedent moisture is very important when analyzing a watershed. If a soil is already saturated before the storm starts than it will produce more runoff than a soil which starts unsaturated. In order to account for these important soil conditions, Curve Numbers (CN) have been established to easily calculate runoff for different watersheds. These curve numbers range from 0 to 100 and are proportional to the amount of runoff produced by their respective watershed. A few typical curve numbers for antecedent moisture condition II (normal soil moisture condition) are shown in Figure 3.1.2. More curve numbers can be found in the NRCS TR-55 Urban Hydrology for Small Watersheds. Determination of the curve number for a watershed or subbasin is straight forward. Soil use, cover type, treatment, hydrologic condition, and hydrologic group are used to establish a base curve number. This curve number is then adjusted for different antecedent moisture conditions. Then, the design storm is used along with the curve number to establish the runoff depth for the area of interest. Once the amount of infiltration has been determined it is then possible to determine the amount of rain fall excess, or runoff that must be handled by the sewer system. The amount of runoff can be quantified by taking an accumulation of hourly rainfall intensities and subtracting the initial base flow of the system, initial abstractions, and hourly infiltration rates. The remaining water is represented as a runoff hydrograph. Deriving an exact runoff hydrograph for different subbasins on projects using exact observed data from each subbasin is usually not worth the investment. Different methods have been developed that take a total amount of runoff, or a peak runoff rate, and approximately distribute it throughout a storm period to produce a runoff hydrograph for the pour point of the subbasin. This is not an exact representation of the subbasin’s response to a rainfall event; however, it is close enough for practical use. The runoff hydrograph uses three important parameters when defining a watershed’s response to a storm event. These are the time of concentration, time to peak, and time of base. The time of concentration can be thought of as the hydrologically (the path that water would travel) most distant point from a location in the watershed to the outlet of a watershed or subbasin. It is important to note that time of concentration is very different than the spatially most distant most point. In some situations the hydrologically most distant point can be spatially close to the output of the watershed. Time to peak is simply is the time from the beginning of the watershed response to the peak of the hydrograph. This occurring during the rising limb of the hydrograph. Time of base is the entire length of the watershed response. One of the simplest runoff models is the triangular unit hydrograph. It is an approximation of the watershed response (runoff) when one unit of rainfall excess is applied to the watershed. This hydrograph accurately represents the peak flow and time to peak for the watershed response while interpolating the rest of the ordinates. From Figure 3.2.1 you can see that the base time is assumed to be 2.67 times the time to peak for the hydrograph. Also from this method the lag time can be determined, which is shown as middle of the rain fall excess to the peak of the hydrograph. This method of runoff modeling is very quick and useful when the peak runoff and time to peak are the only important considerations of the watershed response. However, it is very simplified and is not applicable when a more accurate representation of the runoff hydrograph is necessary. The Natural Resource Conservation Service (NRCS) has developed an average dimensionless hydrograph from an analysis of many unit hydrographs from different locations in the US. 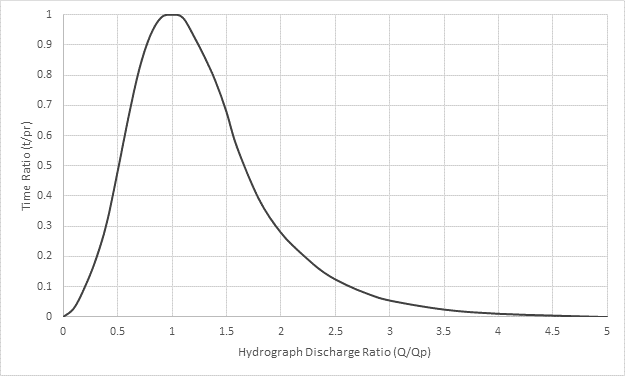 This dimensionless hydrograph uses ordinate values of discharge and Time which are normalized by the time to peak and peak flow. In order to use the NRCS dimensionless hydrograph the values for peak flow and time to peak must be known. These values are obtained from storm parameters such as intensity and duration as well as the ground infiltration. To obtain the discharge values for the storm the peak flow is multiplied by each discharge ratio of the NRCS dimensionless hydrograph. The same is done with the time to peak value and the time ratio ordinated of the dimensionless hydrograph. These products will yield a unit hydrograph for the desired watershed and storm. Figure 3.2.2 shows the NRCS Dimensionless Unit Hydrograph. This method of modeling runoff is based off an algorithm originally used by EPA SWMM. This method uses a surface water budget approach and may be visualized by Figure 3.2.3. 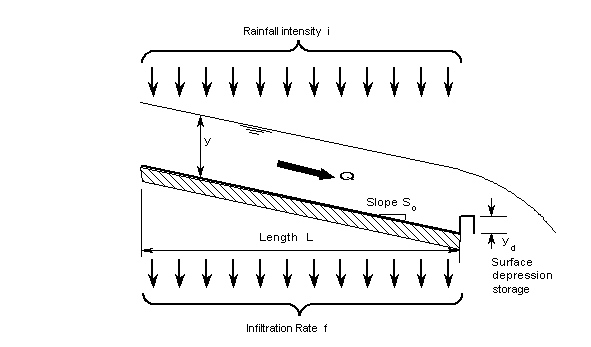 The Rainfall intensity is used as an input for the control volume on the surface plane. The output from this control volume is a combination of the runoff Q and the infiltration rate f. The infiltration is computed using a specified method such as Green-Ampt or Horton. If it is assumed that the subbasin has a unit breadth then a continuity equation and a dynamic equation is produced which takes into account the surface depression storage depth of the subbasin. The ultimate goal is to obtain a value for Q, the rainfall excess that turns into runoff. This is accomplished using advanced techniques which are outside the scope of this discussion, however, more information can be found in Rossman’s 2010 revised Storm Water Management Model User’s Manual. There are a few issues when using this method for runoff modeling. The first being that the continuity and dynamic equations used to define the algorithm imply that the depth of flow over the subbasin plane is uniform, which overestimates the storage of the plane and results in an overly attenuated runoff peak. Another assumption is that infiltration continues on the entire surface after cessation of rainfall. In practice however, after the rainfall ceases, the surface water tends to concentrate in depressions which then infiltrate. This depression infiltration area can be much smaller than the entire area of the subbasin. This assumption results in hydrographs that generally have a more severe falling limb that the NRCS Triangular or dimensionless hydrographs. Once the amount of runoff is determined using the methodology discussed above, the runoff will need to be routed through the system. 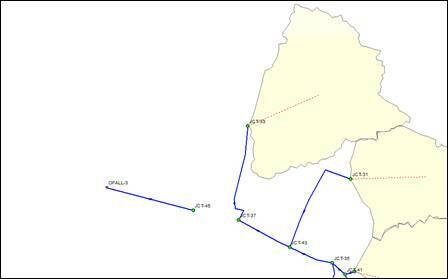 InfoSWMM uses three methods of routing. The steady-state method is by far the simplest method. The kinematic wave method and dynamic wave method are both very powerful modeling tools. However, they are more complex than the steady-state approach. The dynamic wave method is the best modeling tool when modeling a sewer system under pressurized conditions. Steady flow routing uses the assumption that with each computational time step flow is uniform and steady, therefore, the flow is simply translated downstream. This method can only be applied to dendritic conduit layouts; meaning, each conduit can have multiple inputs but only one output. A natural drainage system, such as a river complete with tributaries, is another example of a dendritic network. Steady flow does not account for channel storage, backwater effects, head losses, flow reversal or pressurized flow. This method is only appropriate for preliminary analysis. Kinematic waves govern flow when inertial and pressure forces aren’t dominant. For a kinematic wave gravity and friction forces are balanced, hence the flow is considered uniform. This implies that the flow does not accelerate appreciably. For kinematic waves, the energy grade line is parallel to the channel bottom. Kinematic waves are useful when channel slopes are steep and back water effects are negligible. The kinematic wave method of routing is based off the theory of kinematic wave celerity. In the context of routing, a wave is simply a variation in flow. Wave celerity is the velocity with which this variation travels along the channel. Kinematics is the study of motion without the influence of mass and force. Kinematic wave routing can simply be thought of as a model for how waves, notwithstanding mass and force, are propagated along a channel. The main assumption of this model is that conduits in the SWMM flow full but not pressurized. Flow which is excess of full normal flow can be accounted for through system losses, ponding, or diversion. Flow that is ponded will be introduced as capacity becomes available. Routing a hydrograph through a SWMM using this method results in attenuation and flow delays when compared to steady routing. Kinematic routing has a few modeling limitations. Like steady state, this method can only be applied to a conduit layout that is dendritic. The diversion of flow throughout this dendritic network is defined by the user. The user can define this diversion using a constant ratio or a curve which varies with flow. Kinematic routing cannot account for backwater effects, head losses, flow reversal, or pressurized flow. This routing method is commonly used for master planning purposes and is considered conservative when compared to dynamic wave routing. Dynamic wave modeling is applicable when inertial and pressure forces are dominant. For dynamic waves the energy grade line is not parallel to the channel bottom, and hence the flow can be non-uniform, or varied flow. Dynamic wave routing is based on dynamic wave celerity defined by the Saint Venant equations in Section 2.2. A walkthrough of dynamic wave celerity is beyond the scope of this discussion; however, this method accounts for more realistic and complete dynamics of routing by allowing waves to propagate both upstream and downstream at the same time. For a detailed derivation see Chow’s Applied Hydrology. Two advantages of dynamic wave routing are the ability to model complex network layouts as well as accounting for pressurized flow. Both steady and kinematic routing require a dendritic conduit network. When using dynamic wave modeling however, many different layouts are possible. When handling a pressurized flow situation, such as a surcharge event, frictional head losses must be accounted for. This method can use either the Darcy Weisbach or Hazen Williams equations discussed in Section 2.2 to model the head losses associated with frictional resistance. Kinematic routing mainly accounts for excess flow by user defined diversion, where dynamic routing accounts for excess flow by pressurizing the flow and increasing the flow rate. In kinematic routing the user must input diversion ratios for the model. 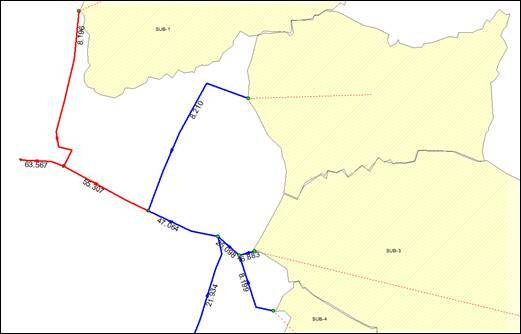 This method does not require this information rather, it describes how flow will be diverted throughout the network. Dynamic wave routing also accounts for channel storage, head losses, and flow reversal. Hydrographs produced by this method will be attenuated and delayed similar to the kinematic method, however, the peak flow ordinate is usually reduced. The main drawback to the Dynamic wave routing method is the time required to run the model. Due to the sensitivity of the Saint Venant equations, a smaller time step must be used when solving them relative to kinematic wave routing. When modeling with a kinematic wave a time step of ten to fifteen minutes can be used. In contrast, a time step of less than a minute must be used with the dynamic method in order to obtain accurate results. Dynamic wave routing is generally used for the final design of a drainage system. With a general look at the theory and background of stormwater systems, the robustness of InfoSWMM can be shown through various examples. The examples are also used to illustrate the types of analysis and design considerations the practicing engineer would encounter. Note that we assume you are familiar with the software and that the InfoSWMM Users Guide has been read before starting this workbook’s case studies. It may also be helpful to be familiar with basic functions in ArcMap. Most sewer systems are gravity driven, with occasional segments of pressurized conduits called force mains. As a result, pressure is not one of the foremost concerns when analyzing the stormwater system. The largest concern is typically manhole surcharging (i.e. flooding). Stormwater in excess of the sewer system’s capacity causes surcharging. This can cause streets and homes to become flooded, which can have disastrous effects on a community. Stormwater systems are typically designed to flow just under surcharging conditions when faced with a certain sized storm event. For most communities, stormwater systems are designed to withstand the 100-year, 24-hour storm event without surcharging. Refer to Section 8.0 for a list of external texts that deal with stormwater system design. Through the use of a StormWater Management Model (SWMM) such as InfoSWMM, it is possible to model a sewer system’s response to a storm event to determine where flooding problems may occur. 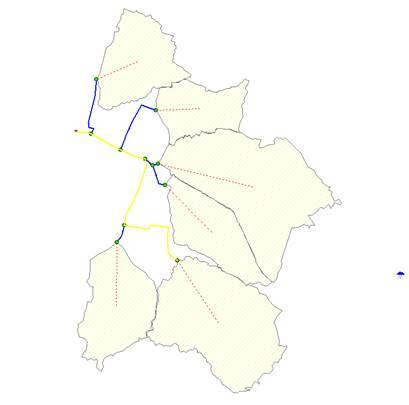 In the first case study, you will analyze a sewer system which is fed from various subbasins. Each of these subbasins has its own hydrologic characteristics (i.e. infiltration, interception, time of concentration, etc. ), which models the volume of runoff it contributes to the sewer system. The runoff will then be routed through the sewer system, and you will produce a water surface profile to analyze where flooding may occur. Here, A represents the cross sectional area of the channel, R represents the hydraulic radius of the channel (area divided by wetted perimeter), S represents the slope of the channel, and n represents Manning’s n.
In order to increase conveyance, the design engineer may choose to increase the effective cross sectional area of the channel. In this case study, circular conduits are used to convey water to an outfall. Therefore, to increase the effective cross sectional area, the diameter of the conduit can be increased or the number of barrels used to transport water can be increased. Both options are utilized by design engineers in everyday practice. Other options to increase conveyance may be to make the channel material as smooth as possible – essentially minimizing the Manning’s n value. Alternatively, design engineers may choose to increase the slope of the channel. This can be done by placing junctions in strategic locations to minimizing channel sinuosity (i.e., straightening out the channel). For external information regarding the Manning equation, refer to Section 8.0. With this in mind, it is now possible to analyze the stormwater system of KYCity. The file that will be used for this case study is titled “SWMM_CaseStudy1.mxd” and can be found in the downloaded InfoSWMM Student Analysis and Design Workbook folder. The first step is to open the SWMM_CaseStudy1.mxd file in InfoSWMM. Many of the following steps are supplemental to the InfoSWMM Users Guide. If you feel as though basic set up procedures are unnecessary, you may skip to Step Two on page 28. Choose the “Start” menu, select Programs, choose the InfoSWMM program group and choose InfoSWMM. 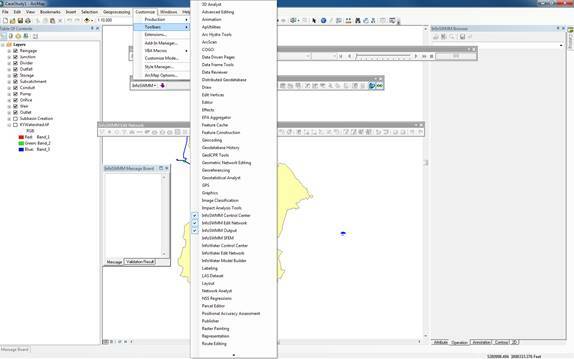 Choosing InfoSWMM automatically starts your version of ArcMap since InfoSWMM is an extension of ArcMap. In the ArcMap window, select An Existing Map option in the Start Using ArcMap With area and then click the “OK” button. This can also be accessed by choosing File » Open from the ArcMap command menu. Navigate to the directory containing the SWMM_CaseStudy1.mxd project and choose that file. This is found in the InfoSWMM Student Analysis and Design Workbook folder. The KYCity network, which will be the primary model for the subsequent case studies,will now be displayed in the ArcMap window. It is important that the proper toolbars are visible while using InfoSWMM. The InfoSWMM Control Center toolbar, InfoSWMM Edit Network toolbar, and InfoSWMM Output toolbar should all be open. To open these, choose Customize from the menu bar of ArcMap, click Toolbars, and then choose InfoSWMM’s toolbars (boxed in red in the following figure). Next, initialize InfoSWMM by choosing the Initialize Project icon on the InfoSWMM Control Center toolbar. 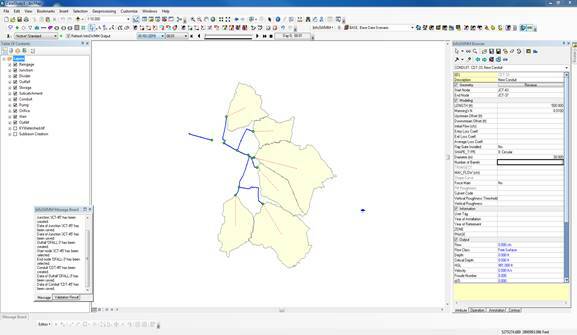 Note that it is not necessary to specify a coordinate system for KYCity, as was the case in the Quick Start Tutorial of the InfoSWMM Users Guide. This is because KYCityhas previously been assigned a coordinate system and projection. 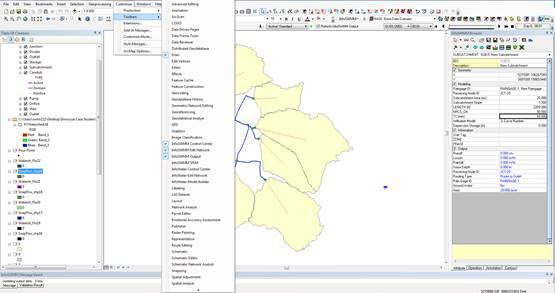 Now that InfoSWMM has been initialized and the SWMM_CaseStudy1.mxd file has been opened in ArcMap, the next step is to prepare the KYCity system for an analysis. It is necessary to first define the basic project units and hydraulic/hydrologic properties. In this example system, Standard English units are used and flow is measured in cubic feet per second. Infiltration is modeled by the NRCS Curve Number Method, which was discussed in Section 3.0. External information on this method can be found in Section 8.0.This method empirically quantifies a watershed’s soil type and land use to measure the land’s resistance to runoff infiltration. A high curve number will produce more runoff than a low curve number. Detailed information pertaining to the Curve Number Method can be found in the United States Department of Agriculture’s Urban Hydrology for Small Watersheds TR-55 document (USDA 1986). Since the Curve Number Method is used to model infiltration, a NRCS dimensionless unit hydrograph will be used to model runoff. These models typically are used in conjunction to simulate hydrologic properties. In order to specify these modeling parameters, navigate to the InfoSWMM Browser window. Select the Operation tab near the bottom of the window. Next, select Options » Base, Base Simulation Options. Set Flow Units to CFS. 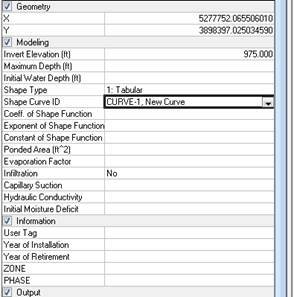 Set Infiltration Model to NRCS Curve Number. Set Routing Model to Dynamic Wave. This will allow for surcharging conditions to be better modeled if they occur. Refer to Section 3.0 for more information. 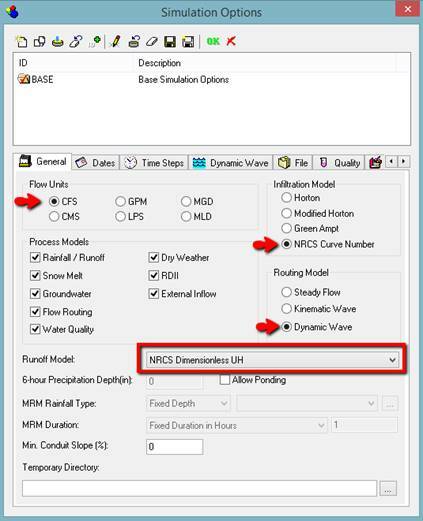 Set Runoff Model to NRCS Dimensionless UH. Click through the other tabs and observe their default conditions. 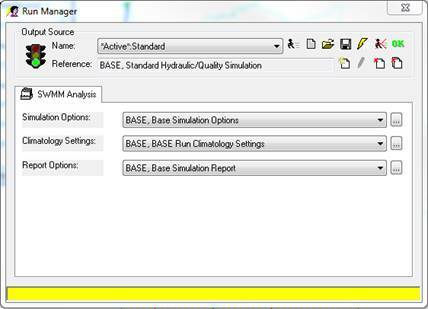 Do not change any of the default conditions, but take note of how the simulation is set up and how hydraulic and hydrologic processes are modeled. From the Time Steps tab , it is possible to see that the reporting time step is one hour. From the Dynamic Wave tab , it is possible to see that when conduits become pressurized, the Hazen-Williams equation will be used. Information pertaining to the Hazen-Williams equation can be found in Section 2.2. Click the save icon and press the “OK” button to close the Simulation Options window. Basic project units and simulation parameters have now been defined. In this step, you will define a 24-hour cumulative hyetograph to represent the 100-year, 24-hour storm. Suppose that after a statistical analysis, you discover that the 100-year, 24-hour storm for KYCityis equal to approximately 4.50 inches of rain. Recall that this storm event is typically used to design components of stormwater networks. InfoSWMM has the capability to automatically create a cumulative hyetograph based only on this information. 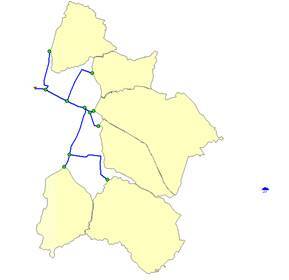 Notice that a raingage has previously been created for the KYCitydrainage network. Note that there is nothing defined in the Time Series field.To create a new time series, navigate to the InfoSWMM Browser window. Click the Operation icon at the bottom of the window. 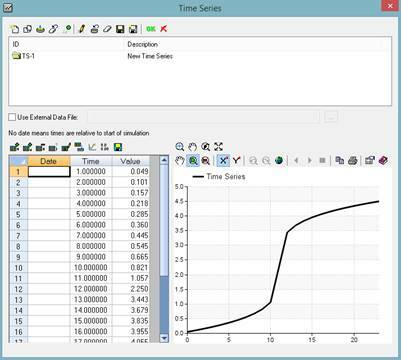 Right-click Time Series and select New. The New Time Series window will open. Type “TS-1, New Time Series” in the New ID field. 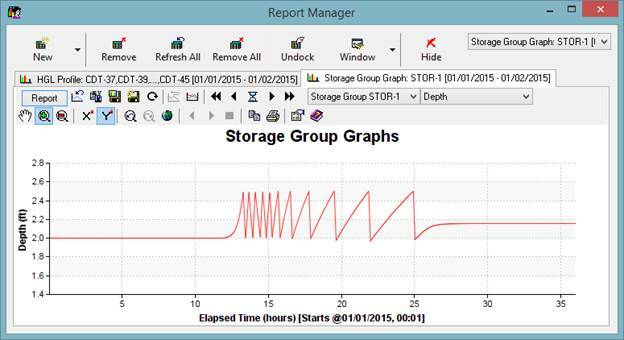 Click the Create Hyetograph icon to open the Create Hyetograph Time Series window. In the Storm Type field, click the drop down icon and choose, “SCS2”. This means that an SCS type-2 storm will be used in this model. This type of storm is typical for much of United States away from coastal regions. In the Total Storm Depth field, type, “4.5”. This is the depth of the 100-year 24-hour storm for KYCity. In the Time Series Interval (minute) field, type 60. This will specify a 24-hour hyetograph with 60-minute intervals. Click the save icon and press the “OK” button to close the Time Series window. Click the Attribute tab on the InfoSWMM Browser. From the InfoSWMM Edit Network toolbar, select the Select Element icon and click the raingage on the screen if it has been unselected. The model has now been properly updated and is ready for an analysis to be run. Note that all other information pertaining to conduit diameters, lengths, and Manning’s n values has previously been entered. Similarly, nodal and subcatchment information has already been entered and modeled. It is not necessary for the user to input information pertaining to the KYCity network unless explicitly stated otherwise. Information pertaining to an element of the system can be inspected by clicking the DB Editor icon on the InfoSWMM Control Center toolbar or by selecting the Select Element icon from the InfoSWMM Edit Network toolbar and then selecting an individual element. This information can then be viewed in the InfoSWMM Browser – Attribute tab. Since all simulation options have previously been set, the model is ready to be run. Click the Run icon in the Run Manager window. It will take several moments for the model to run. If the simulations has run successfully, a green light will appear on the Stoplight icon . Press the “OK” button when there has been indication of a successful run. There are several methods that you can use to review the results. To view results on the map, press the Map Display icon on the InfoSWMM Control Center toolbar. In the Element Type section, choose “Conduit”. In the Data Source section, choose “Active Output”. In the Data Field dropdown, choose “FLOW (Flow)”. Click “Apply” and then “OK”. Flow values will appear on the map (though you may need to change the output time; see step 6 below). Alternatively, the Select Element icon can be used to click on various elements in the network. Results can be seen in the InfoSWMM Browser – Attribute tab. There are 36 hours of data for this simulation (as specified in Step 1 of Section 4.1). To change the time of the results being shown, it is possible to drag the slider on the InfoSWMM Output toolbar to the desired time. Alternatively, a specific date and time can be specified directly from the InfoSWMM Output toolbar. Click the New icon on this window to open the Output Report/Graph window. Click the *Active*: Standard text, then choose the Graph Report tab . Observe different times throughout the simulation to see if the network has issues with flooding. Click the hourglass icon to open the Graph Settings window. Type, “5” in the Stepping Interval field. Click “OK” to close the Graph Settings window. Next, press the fast forward icon to watch an animation of the water profile in the system. At first, you will see no water in the system. At approximately hour 14:00, however, notice that the pipes are almost completely full. It is possible to watch this process in reverse by pressing the fast backward icon. Save your system as “SWMM_CaseStudy1_analysis1.mxd” to the InfoWater Student Analysis and Design Workbook folder. By viewing this graph, it is evident that the hydraulic grade line is at the surface of JCT-43. This indicates that water is surcharging at this location and time. It is highly likely that flooding will occur at this location during the 100-year, 24-hour storm. As a design engineer, you know that this is unacceptable and that the stormwater drainage system for KYCityis currently undersized. In the next section, it will be your job to correctly size the network. In the InfoSWMM Student Analysis and Design Workbook folder, you will find a TIFF image. The name of this file is KYWatershed.tif (be sure to keep the KYWatershed.tif.aux file in the same directory as the TIFF image to ensure a spatial matching of the image with the network). Note that by checking or unchecking the box in the Table of Contents window pertaining to the satellite image, the layer can be turned on or off. The volumetric capacity of the system can be increased by increasing the size of the network. There is a subtle difference between the two approaches; however, this allows the engineer to look at the same problem from multiple angles and select the best solution. For example, a detention facility would limit the amount of water entering the stormwater system (decreasing flowrate into the system) and installing larger conduits would increase the system’s storage capacity and conveyance ability (increasing flowrate out of the system). Typical engineering practice constitutes that detention facilities are constructed after a watershed has undergone some sort of urbanization or development. As you have probably learned, the peak of the watershed’s hydrograph is increased when watersheds are urbanized. The main goal of a detention facility is to attenuate the peak of the post-development hydrograph to a point that is less than or equal to the pre-development hydrograph peak. For further suggested reading regarding this topic, refer to Section 8.0. In this situation, no urbanization has occurred (you will learn in Section 5.0 that urbanization is typically modeled by an increase in a watershed’s curve number). Since surcharging occurs naturally during the 100-year, 24-hour storm, it is evident that the stormwater network is undersized. Therefore, it is your job to increase the effective cross sectional area of the conduits conveying stormwater. This will increase the capacity of runoff that the network can hold. As mentioned in Section 4.1, to increase the effective cross sectional area, the diameter of the conduit can be increased or the number of barrels used to convey water can be increased. Sizing a stormwater system is typically an iterative process that requires trial and error to ensure that surcharging does not occur during a certain storm event. For these steps, you will use the system that you saved at the end of Section 4.1. Since JCT-43 is surcharging, it is likely that the immediate downstream conduit is undersized. Therefore, you will resize CDT-33. 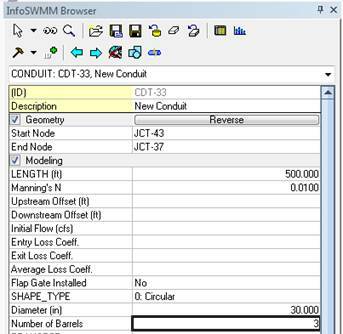 Choose the Select Element icon from the InfoSWMM Edit Network toolbar and click on CDT-33. Notice that the diameter of the conduit is 30 inches and the number of barrels is 2. By increasing the number of either of these attributes, more water will be conveyed. Click in the Diameter (in) field of the InfoSWMM Browser – Attribute tab. Type, “36” into the field and press the enter key. Press the Save Current Record icon . Now that the conduit has been resized, run an analysis to determine if enough water is conveyed to eliminate surcharging during the 100-year, 24-hour storm. Since the simulation options have previously been set, the model is ready to run. Click the Run icon in the Run Manager window. It will take several moments for the model to run. If the simulations has run successfully, a green light will appear on the Stoplight icon . Press the “OK” button when there has been indication of a successful run. 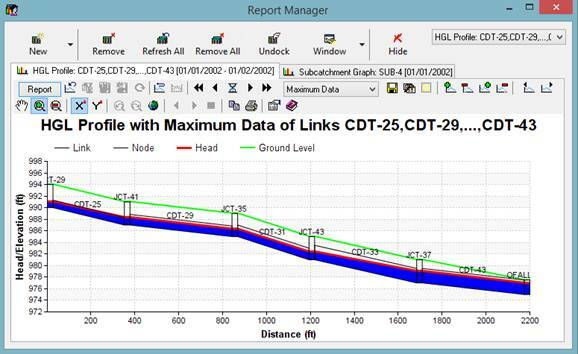 Review the water surface profile by clicking the Report Manager icon on the InfoSWMM Control Center toolbar. The Report Manager window will open. 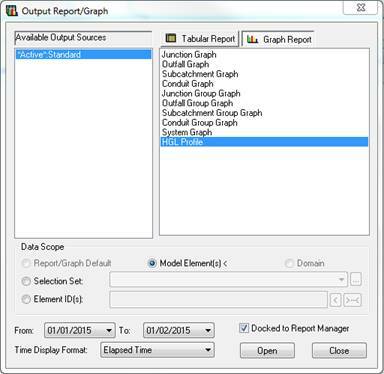 Choose New from the Report Manager window to open the Output Report/Graph window. Right click and press Enter. The Report Manager window will reopen. Notice the location of the water surface. At no point does water surcharge or spill over top of any of the junctions. At some locations, the water flows just under the full amount (but still acts as open channel flow). This shows that our system is sized well for the 100-year, 24-hour design storm and has a bit of extra capacity, or a factor of safety. In the next step, you will resize the system by increasing the number of barrels. Use the Select Element tool to choose CDT-33. 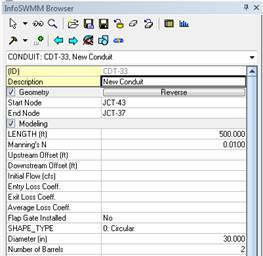 In the InfoSWMM Browser – Attribute tab, change the diameter of the conduit from 36 inches back to 30 inches (the diameter of the conduit when surcharging occurred). 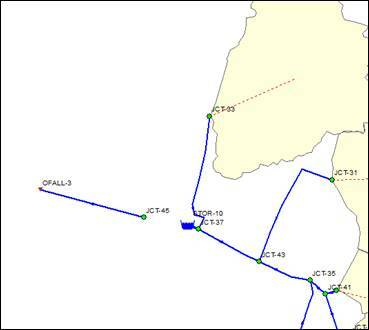 Run an analysis on the system using the aforementioned steps to view the water surface profile. 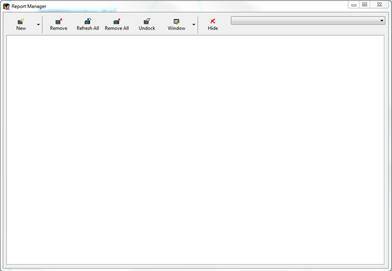 On the InfoSWMM Output toolbar, click the Run icon . The Run Manager window will appear. Click the Run icon in the Run Manager window. It will take several moments for the model to run. If the simulations has run successfully, a green light will appear on the Stoplight icon . Press the “OK” button when there has been indication of a successful run. Choose *Active*:Standard and HGL Profile from the Graph Report tab to generate the water surface. Click “Open” to return to the map and select the conduits for which you wish to view the water surface profile. Choose the same conduits that were mentioned in Section 4.1. Notice the location of the water surface. At no point does water surcharge or spill over top of any of the junctions. At some locations, the water flows just under the full amount (but still acts as open channel flow). This shows that our system is sized well for the 100-year, 24-hour design storm and has a bit of excess capacity. By increasing the effective cross sectional area of the stormwater system, you have solved the capacity problem posed by the undersized system. As you have seen, there are several methods that can increase the effective size of the cross sectional area of conduits. It is advised that you attempt to resize other conduits in the network to see how changing the conduit size and number of barrels affects the capacity of the system. But note that increasing the capacity of your system upstream can create problems downstream as you are allowing more flow. In the next case study, you will alter the inflow of water into the system by modeling a detention facility. In Case Study I, you analyzed a sewer system and solved a surcharging problem. Now you will take a look at subbasin modeling and the travel of water from the storm through the subbasin to the sewers. As mentioned previously, there are a couple of ways to approach a surcharging problem. In Case Study I, you approached the problem from the standpoint of a system which was under capacity, and you fixed the problem by adding a new conduit. Now consider that you are notified of additional surcharging problems in another portion of the system. Assume that this part of the system runs underneath a residential area, and breaking ground to lay new sewer lines would mean acquiring expensive easements. In this situation, you can approach the problem from the perspective that there is too much water entering the system. A solution is to simply reduce the amount of water entering the sewer system. Case Study II deals with this alternative approach to solving surcharging problems. Depending on a couple different factors, such as the price and availability of land, this approach can be a cheaper alternative than installing new infrastructure. Urbanization, or land development causes significant changes in the area’s hydrologic response to a storm event. Increased impervious surfaces naturally cause a decrease in infiltration and interception, and an increase in runoff. Consequently, this increase in runoff can cause flooding problems downstream for existing systems which were originally designed to handle a lesser volume of water. As described in Section 3.0, Modeling Background, the hydrologic characteristics of a watershed can be modeled in InfoSWMM with different methods. 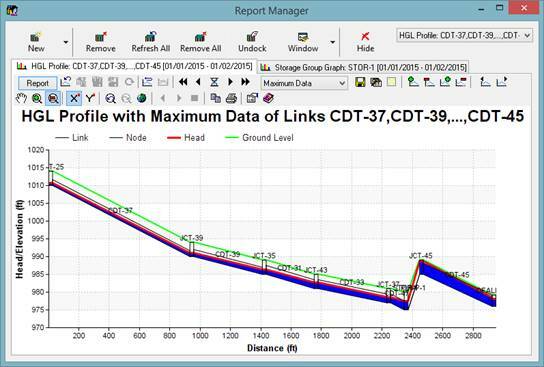 For this case study, you will model the subbasin using the NRCS Curve Number Method. Assume that the city government is planning on constructing a large parking lot in subbasin 4 (SUB-4). This parking lot will certainly produce more runoff than the existing basin. Thus, you as the engineer must model the change in hydrologic characteristics and the resulting change in runoff for the subbasin before a solution can be found to prevent flooding. The rest of this case study will walk you through the steps to model this problem. The system that will be used is titled “SWMM_CaseStudy2.mxd” and can be found in the downloaded InfoWater Student Analysis and Design Workbook folder. The first step is to open the SWMM_CaseStudy2.mxd file in InfoSWMM. Many of the following steps are supplemental to the InfoSWMM Users Guide. If you feel as though basic set up procedures are unnecessary, you may skip to Step Two. Choose the “Start” menu, select Programs, choose the InfoSWMM Version X program group and choose InfoSWMM. In the ArcMap window, select An Existing Map option in the Start Using ArcMap With box and click the “OK” button. This can also be accessed by choosing File » Open from the ArcMap command menu. Navigate to the directory containing the SWMM_CaseStudy2.mxd project and choose that file. 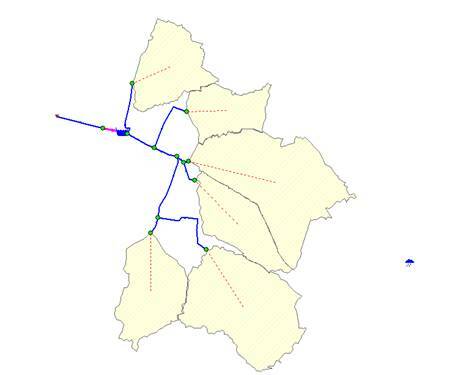 The KYCity subbasin and sewer model, which will be the primary model for this case study, will now be displayed in the ArcMap window as shown in Figure 5.1.1 below. Note that the system has been altered from the previous case study, although the schematic is the same. DO NOT use the previous system saved from SWMM_CaseStudy1 for this case study, or your results may differ significantly. Make sure that the InfoSWMM Control Center toolbar, the InfoSWMM Output toolbar, and the InfoSWMM Edit Network toolbar are shown. To do this, choose Customize from the Menu bar. Click Toolbars, and then make sure that all toolbars mentioned in the previous sentence are selected as shown in Figure 5.1.2 below (inside the red box). It is now necessary to initialize InfoSWMM. This button is found on the InfoSWMM Control Center toolbar. Press the Initialize icon to initialize InfoSWMM. It is also important that the InfoSWMM Browser and Table of Contents windows are open. To open the InfoSWMM Browser window, click the Brower icon in the InfoSWMM Control Center toolbar. To open the Table of Contents window, which should open by default, click the Table of Contents icon in the Standard toolbar. The final step involves setting up the units and hydrologic properties used to run your analysis. 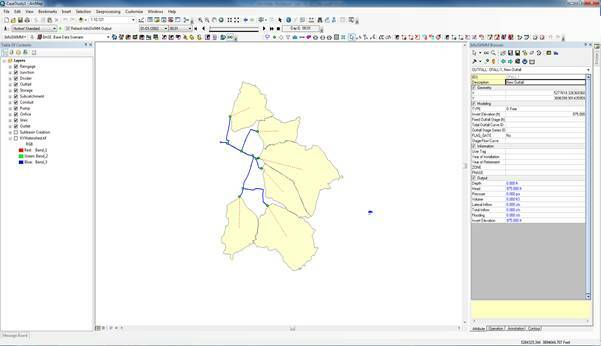 For this case study, you will use the same setup as in SWMM_CaseStudy1. This setup has already been completed for you. However, if you would like to double check the different parameters, refer back to Section 4.1. Choose the Select Element icon and select subbasin 4 (SUB-4). Observe the initial parameters such as curve number (NRCS_CN) and time of concentration (TC) chosen to model the pre-developed subbasin. The initial curve number is 50 and the time of concentration is 1 hour. Choose the Run Manager icon to bring up the Run Manager Window. Then choose the Run icon to run the analysis. A successful run will be indicated by a green stoplight . Choose the “OK” button to exit the Run Manager Window. To view your results, click on the Report Manger icon . Choose New » Active.Standard » Graph Report. Make sure that the Subcatchment Graph option is highlighted and the data scope is Model Elements. 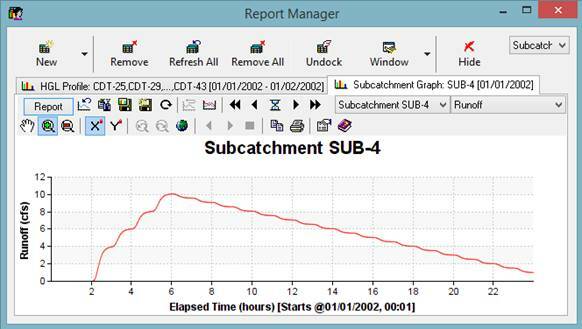 Click Open and select SUB-4 to open the subcatchment graph. Make sure the parameter Runoff is selected in the dropdown menu. The graph as shown in Figure 5.1.3 should appear. Select New » Active.Standard » Graph Report from the Run Manger window. Make sure that HGL Profile is highlighted and Model Element(s) is selected. Click Open. Select each of the pipes which carry water from JCT-29 to the outfall. Right click and choose Enter. Choose Maximum Data from the dropdown menu. You will see that there is no surcharging at any of the junctions. The graph should look like Figure 5.1.4 below. 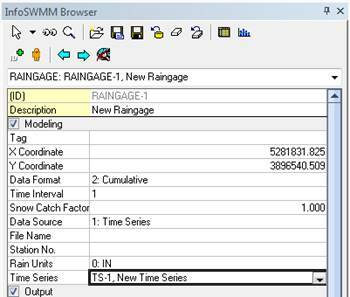 Choose the Select Element icon located in the InfoSWMM Edit Network toolbar and select subcatchment 4 (SUB-4). Change the curve number attribute (NRCS_CN) from 50 to 95. This increase in curve number models the decrease in infiltration and associated increase in runoff. The time of concentration attribute (TC) should also be adjusted from 60 minutes to 30 minutes. Note that the values for TC and NRCS_CN were chosen for illustration purposes. Actual values for these post-development parameters would be calculated based on an external hydrologic analysis of the subbasin. For external resources regarding these hydrologic analyses, refer to Section 8.0. Now you are ready to run the analysis. Choose the Run Manager icon to bring up the Run Manager Window. Then choose the Run icon to run the analysis. A successful run will be indicated by a green stoplight . Choose the “OK” button to exit the Run Manager Window. To view your results, click on the Report Manger icon . Choose New » Active.Standard » Graph Report. Make sure that the Subcatchment Graph option is highlighted and the data scope is Model Elements. 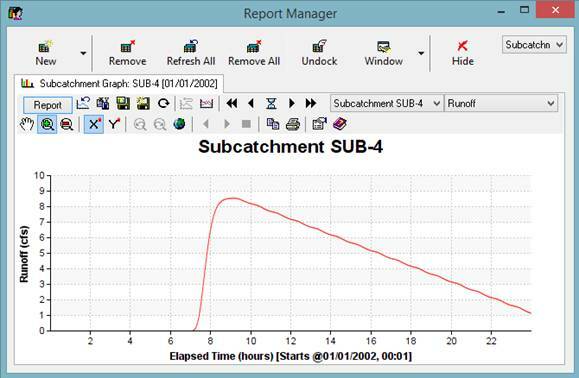 Click Open and select SUB-4 to open the subcatchment graph. Make sure the parameter Runoff is selected in the dropdown menu. The graph as shown in Figure 5.1.5 should appear. Choose Maximum Data from the dropdown menu. You will see that there is no surcharging at any of the junctions. The graph should look like Figure 5.1.6 below. The post-development peak flow is approximately 10 cfs, which is greater than the pre-development peak flow of 8.5 cfs. This increase in peak flow causes surcharging at JCT-29, which is highlighted in Figure 5.1.6 with a red circle. One way to combat flooding effects without installing new infrastructure is to design a storage facility. These facilities capture runoff from a watershed and control the release of water downstream with one or multiple outlet structures. For this case study, you will model a detention basin (one type of storage facility) with an orifice outlet structure for subbasin 4 in order to resolve the flooding issues at JCT-29. To design a detention basin, the pre-development peak flow and the post-development peak flow are needed for volume calculations. Recall these peak flows were found in Section 5.1 to be 8.5 cfs and 10 cfs, respectively. To calculate the volume of the basin, you must calculate the inflow for each time-step into the detention basin, and subtract the peak flow allowed out (pre-development peak flow). Then you must take the largest difference and convert it to a volume using the specified time interval. The detention basin for this case study was already designed for you with the volume, depth, and height/storage curve. You should note that designing detention basins in the real world involves a great deal of hydrologic analysis. For external sources regarding detention basin design, refer to Section 8.0. The following steps will walk you through how to model the storage basin with an outlet structure to eliminate the surcharging found in Section 5.1. Click on the Operation tab in the InfoSWMM Browser window. Double click Curves. Right click on Storage Curves and select New. Call it “CURVE1” when prompted for the New ID. Make sure the Curve Type dropdown menu has 1: Storage (Depth-Area) selected. Click the Insert Row icon 4 times and input the data from Table 5.2.1. Note that this curve defines the surface area of the water at various depths within the detention basin. The program uses this information to determine the volume at different water elevations. Click to save the curve and close the window. Select the Add Storage icon and add a storage facility to the model next to JCT-29. InfoSWMM will prompt you to assign “STOR-10, New Storage” as the Storage ID; just click OK. In the InfoSWMM Browser apply the information from Table 5.2.2 to the storage facility. Click the Select Element icon and select Subcatchment 4. Change the Receiving Node ID to “STOR-10”. Next you will join the storage basin to the sewer system with an orifice outlet structure. Click on the Add Orifice icon from the Edit Network toolbar. Click on the storage basin and connect it to JCT-29 by double clicking. InfoSWMM will prompt you to call the new orifice “ORI-11”; accept the name by clicking OK. Edit the orifice attributes with the data from Table 5.2.3. Note that there are other types of outlet structures which can be modeled such as weirs and spillways. Once the storage facility has been modeled, your map window should look like Figure 5.2.1. To view your results, click on the Report Manger icon . Choose New » Active.Standard » Graph Report. Make sure HGL Profile is highlighted and Model Element(s) is selected. Click Open and select all of the conduits leading from JCT-29 to the Outfall. Choose Maximum Data from the dropdown menu and the graph in Figure 5.2.2 should appear. As you can see from Figure 5.2.2, the surcharging at JCT-29 is eliminated when the detention basin is incorporated into the model. Viewing other reports such as the Storage Graph and the Orifice Graph will help you gain insight into the system’s inner workings. 6.0 Case Study III: Water Can’t Flow Uphill. Or Can It? Water flows downhill as a result of the earth’s gravity. This seems like a pretty logical statement. However, can this statement be violated? Yes, it can. Water does naturally flow downhill. This is a true statement, but not a fundamental physical law. To obtain a physical law, you must add some scientific terminology to the sentence. The fundamental physical law, which cannot be violated, states that water always flows in the direction of decreasing hydraulic grade line. The human race has been using this law to provide drinking water to their communities for about the past 2000 years, ever since citizens of the Roman Empire constructed their impressive aqueducts. Since then, water systems have evolved for the better. One of the most significant improvements in water systems was the ability to pressurize the system and operate it using pumps and tanks. The addition of pumps allowed the hydraulic grade line to be raised at low points in the system, such that water is able to flow uphill. This is how people who live on the mountains get running water from the reservoir down below. Note that we assume you are familiar with the software and that the InfoSWMM Users Guide has been read before starting this workbook’s case studies. It may also be helpful to be familiar with basic functions in ArcMap. So how does the previous discussion apply to sewer systems? Since water only flows downhill in non-pressurized systems, local depressions in the topography can result in ponding water. In urban areas, where the land is likely to be developed, the depressions create flooding problems during large storms. So how do you get water out of the local depression? You have to pressurize the system and pump the water over the next hill. A lift station is a pump station for a sewer system which increases or “lifts” the hydraulic grade line such that water or sewage can flow from a lower elevation to a higher elevation. This case study will include lift station modeling in sewer systems, specifically how to implement them in the InfoSWMM software. First, you will model a depression area at the lowest elevation in the stormwater network and then you will add in a pump to pressurize the system and lift water from a lower elevation to a higher elevation. It will not be necessary for the pump to run 24/7, however. Therefore, real time pumping operations will also be covered and incorporated into the modeling of the lift station. The system that will be used it titled “SWMM_CaseStudy3.mxd” and can be found in the downloaded InfoWater Student Analysis and Design Workbook folder. The first step is to open the SWMM_CaseStudy3.mxd file in InfoSWMM. Many of the following steps are supplemental to the InfoSWMM Users Guide. If you feel as though basic set up procedures are unnecessary, you may skip to Step Two on page 61. Navigate to the directory containing the SWMM_CaseStudy3.mxd project and choose that file. This is found in the InfoSWMM Student Analysis and Design Workbook folder. 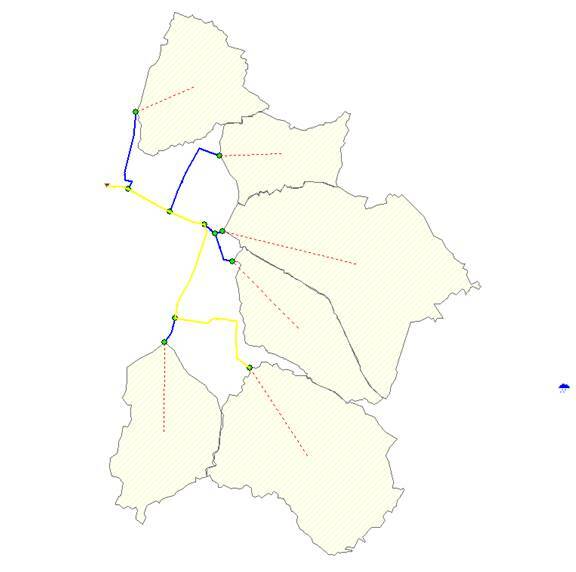 The KYCity network (Figure 6.1.1), which will be the primary model for the subsequent case studies,will now be displayed in the ArcMap window. It is important that the proper toolbars are visible while using InfoSWMM. The InfoSWMM Control Center toolbar, InfoSWMM Edit Network toolbar, and InfoSWMM Output toolbar should all be open. To open these, choose Customize from the menu bar of ArcMap, click Toolbars, and then choose InfoSWMM’s toolbars (boxed in red in Figure 6.1.2). After viewing these junctions, it is evident that in order for runoff to reach the desired outfall, it is necessary for water to first flow uphill. From the previous discussion, you know that one way to do this is to use a pump to pressurize the system and increase the hydraulic grade line. First, however, you will model a storage facility to represent the local depression. This could represent a neighborhood pond or wetlands area. In the Invert Elevation (ft) field, type “975”. In the Initial Water Depth (ft) field, type “2”. This specifies that there is initially 2 feet of water in the storage facility. From Shape Type, choose “1: Tabular”. A storage curve has previously been created for you. Recall that a storage curve describes the storage facility’s design configuration and available volume. These are typically determined through external hydrologic analyses. The storage curve used in this instance has been created for the purpose to show the user how to implement parameters into the InfoSWMM software. To review how to create a storage curve, refer to Section 5.2. From Shape Curve ID, choose “CURVE-1, New Curve”. Leave all other variables as they are. Next, link STOR-1 to JCT-37. To do this, click on the Add Conduit icon , click on JCT-37, and then double click on the STOR-1 icon. The Conduit Identification window will appear. Type, “CDT-47, New Conduit” and click “OK”. In the Length (ft) field, enter “100”. In the Manning’s N field, enter “0.0100”. In the Diameter (in) field, enter “30”. In the Number of Barrels field, enter, “2”. Now that the depression has been modeled, it is necessary to move water from the storage facility up to JCT-45. This is done by creating a pumping station that has the ability to move water from a lower area to a higher area. In this step, you will implement and design a pump so that water is sufficiently carried from the storage facility to JCT-45. You will define the pump curve (also known as a head-discharge curve) for this system, which in this case will represent a theoretical pump that has the ability to move water such that the storage facility does not flood and the upstream network does not surcharge. 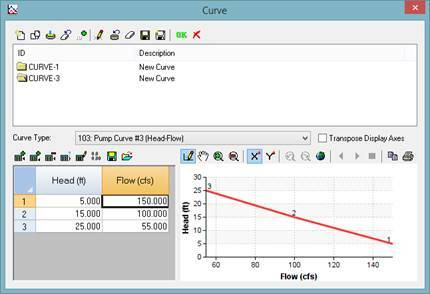 The head discharge curve models the amount of head gained from the pump when a certain flow passes through the pump. Before specifying the parameters of the pump, you should note that the head-discharge curve used to describe this pump is for illustration purposes only. 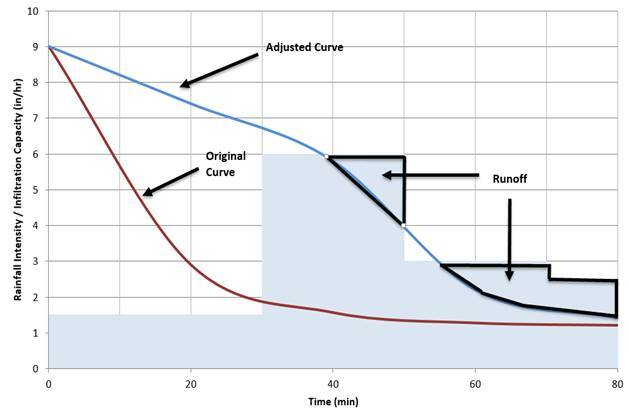 Defining the head-discharge curve relies upon a hydraulic understanding of pumps, which is based on external information, typically provided by pump manufacturers. Further reading regarding this has been identified in Section 8.0. 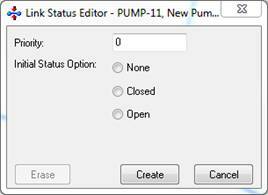 Click the Add Pump icon on the InfoSWMM Edit Network toolbar. Click once on the STOR-1 icon and then double click on the JCT-45 icon. The Pump Identification window will appear. Type “PUMP-1, New Pump” in the Pump ID field. The pump linking the two elements has been created. Now that you have indicated the spatial location of the lift station, it is necessary to design the pump. Pump sizes are typically determined by an operation point and are defined by the head-discharge curve. The head-discharge curve defines several points at which the pump will operate based on the pump’s size and the motor’s power. 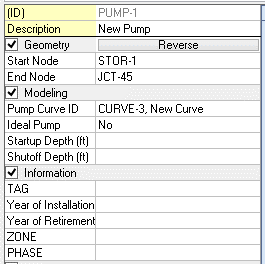 In the next step, you will design the pump station by defining the head-discharge curve. Navigate to the bottom of the InfoSWMM Browser and choose the Operation tab . Click on the Curves dropdown by selecting the plus icon . Next, right click on Pump Curves and choose new. The New Curve window will appear. In the New ID field, type “Curve-3, New Curve”. The Curve window will appear. 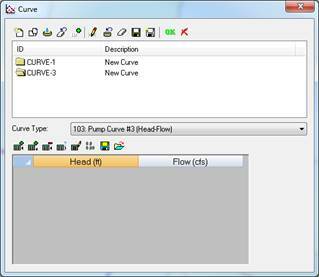 In the Curve Type dropdown menu, choose “103: Pump Curve #3 (Head-Flow)”. Add 3 rows to the table by clicking the Insert Row icon three times. Click the “OK” button to close the window. The head-discharge curve has now been created. In the Priority field, type “1”. Choose “Open” for the Initial Status Option. Click “CREATE” to close the window. Save the file as the SWMM_CaseStudy3_analysis1.mxd to the InfoWater Student Analysis and Design Workbook folder. You have now designed a pump to transport water from a local depression to a higher junction. Before running an analysis to make sure the pump works and you have modeled the network correctly, it is necessary to first define real time pumping operations that will determine when the pump is on and when the pump is off. Currently, the pump is defined as constantly running. You want to design the pump so that at least 2 feet of water will remain in the storage facility at all times to protect local habitat, and to only kick on whenever there is a storm event to prevent flooding. In Section 6.2, you will define the operational controls. Now that the lift station has been incorporated into the model, you will now apply real time controls to operate the pump. This will define when the pump is off and when the pump is on. Recall that you want at least 2 feet of water to remain in the storage facility at all times to make sure that wildlife is properly supported. 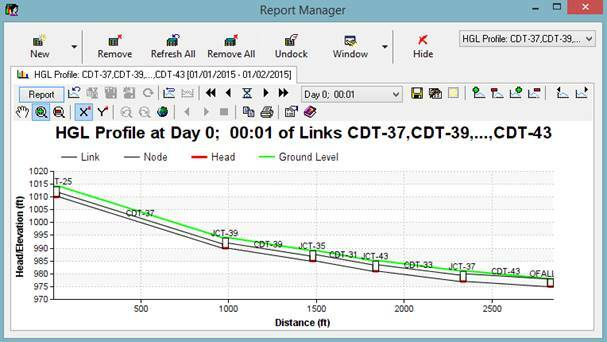 InfoSWMM uses Real Time Control (RTC) Rules to define when objects are off and on. They can also be used to define the speed of the pump if a variable speed pump is being modeled. In this example, you will use the Real Time Control (RTC) Rules function to make the pump turn on when water in the detention facility is above 2.5 feet, and to turn off when the water is less than or equal to 2 feet. Note that it is common practice for the pump to turn off and on at different depth-levels. This is to help lengthen the lifecycle of the pump because rapidly turning a pump off and on can cause damage. Pump manufactures will give guidance on the maximum number of starts per hour. Open the previously saved file titled ““SWMM_CaseStudy3_analysis1.mxd” from Section 6.1 and initialize InfoSWMM if you have not already done so. Navigate to the InfoSWMM Browser – Operation tab. Click the Plus icon next to Hydraulics . Right click Real Time Control (RTC) Rules and choose New. 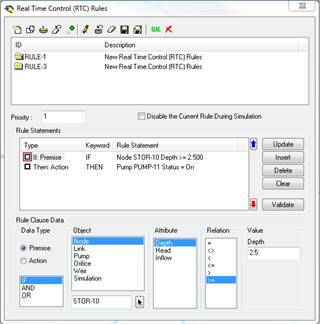 The New Real Time Control (RTC) Rules window will open. 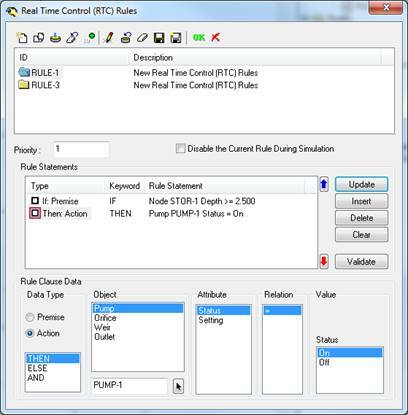 In the New ID field, type “Rule-1, New Real Time Control (RTC) Rules”. The Real Time Control (RTC) Rules window will open. Perform the following tasks to set up the Real Time Control premise. In the Priority field, type “1”. In the Rule Clause Data section, choose Premise as the Data Type. Under Object, choose Node, and in the field below, type “STOR-1”. In the Attribute section, chose Depth. In the Relation section, choose >= and in the Depth field, type “2.5”. Click “INSERT” in the Rule Statements section. In the Data Type section, choose Action. For Object, choose Pump and type “Pump-1” into the field. Under Attribute, choose Status and under Status choose On. Next, define when the pump is off. You want the pump to turn off when the water elevation is less than or equal to 2 feet. To do this, create a new Real Time Control. In the Rule Clause Data section, choose Premise as the Data Type. Choose “IF”. In the Relation section, choose <= and in the Depth field, type “2”. Define the action clause. In the Data Type section, choose Action. Choose “Then”. Under Attribute, choose Status and under Status choose Off. 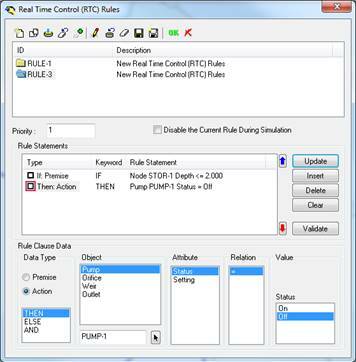 The Real Time Control (RTC) Rules window should look as follows for Rule-3. You have defined that the pump will kick on whenever the depth of water in the storage facility is at or above 2.5 feet and will turn off whenever the depth in the storage facility reaches 2 feet. Now it is possible to run the model to determine if the pump does its job correctly. Click the Run icon on the INfoSWMM Output toolbar. The Run Manger window will open. All simulation options have already been set. They match those set in Section 4.1. Click the Run icon on this window to run a simulation. A successful run is indicated by a Green Stoplight . It may take a few moments to run the simulation. Once the green light appears, click the “OK” button . Click the New icon on this window to open the Output Report/Graph window. Click *Active*: Standard text, then choose the Graph Report tab . Note that no surcharging occurs at any junction throughout the system. This means that you have successfully modeled the lift station to remove the excess water before a surcharge occurs. Note, however, that successful lift station design is much more complicated in the real world. The numbers used here are to illustrate the capabilities of the software. It is necessary to incorporate external hydraulic knowledge in order to successfully design a lift station on your own. For pump/lift station structure design, it is recommended that you refer to a hydraulic design manual, such as the Hydraulic Institute’s Pump Standards manual. This is cited in Section 8.0. From the Report Manger, click the New icon . The Output Report/Graph window opens. Click *Active*: Standard text, then choose the Graph Report tab . Choose Storage Graph and click “OPEN”. Choose STOR-1 from the map screen. Notice that the depth of water in the storage facility is almost always between 2 and 2.5 feet. Also note the infrequent fluctuation of when the pump is on and off. This means that you have correctly designed the real time controls to keep approximately 2 feet of water in the storage facility at all times and prevent rapid fluctuation of the pump. Pipes are depreciating assets. Over the course of their useful life, pipes will naturally deteriorate due to a number of factors (e.g. corrosive soil, freeze thaw cycles, etc.). Many pipes will develop cracks or holes which act as open doors, letting water both in and out. This can cause significant water quality problems if raw sewage is leaking into the groundwater, and it can also cause flooding issues if too much groundwater is leaking into the pipe. Modeling can play an important role in the detection of these leaks, which has been an area of concern for utilities for many years. This final case study will deal with identifying and modeling the leaks in InfoSWMM and calibrating the model with field data from your system. Identifying places in your system which are leaking can be challenging and expensive. There has been much research devoted to the subject of leak detection, with some success. One of the easy ways to detect leaks is to do a mass balance calculation (simple addition and subtraction calculations) on a controlled segment of your system. To illustrate we focus on an individual pipe segment in the system. If you know how much water is flowing into the pipe upstream, and how much water is flowing out downstream, then any difference in the two values is a either a source or a sink (an addition or a subtraction) to the volume in the pipe. Exceptions to this statement occur in open channel flow when there is prism or wedge storage within the conduit. This section of the case study will walk you through the process of identifying leaks in your system. 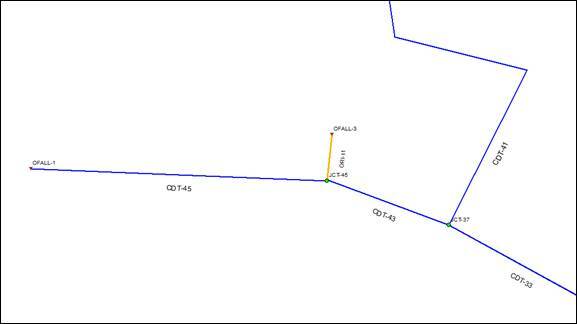 Navigate to the directory containing the SWMM_CaseStudy4.mxd project and choose that file. 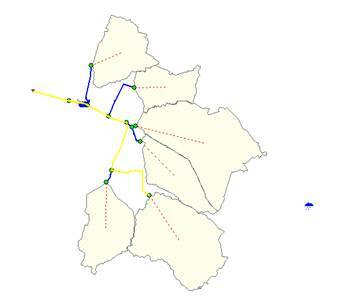 The KYCity subbasin and sewer model, which will be the primary model for this case study, will now be displayed in the ArcMap window as shown in Figure 7.1.1. Note that the system has been altered from the previous case study, although the schematic is the same. DO NOT use the previous system saved from SWMM_CaseStudy3 for this case study, or your results may differ significantly. Make sure that the InfoSWMM Control Center toolbar, the InfoSWMM Output toolbar, and the InfoSWMM Edit Network toolbar are shown. To do this, choose Customize from the Menu bar. Click Toolbars, and then make sure that all toolbars mentioned in the previous sentence are selected as shown (boxed in red) in Figure 7.1.2. The final step involves setting up the Project to run your analysis. 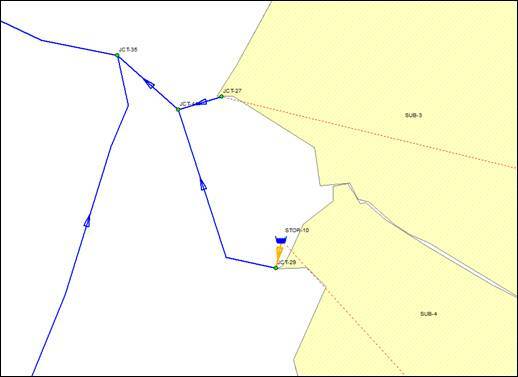 For this case study, you will be using the same run setup as in SWMM_CaseStudy1. This setup has already been done for you. However, if you would like to double check the different parameters please refer back to Section 4.1 for the project setup. 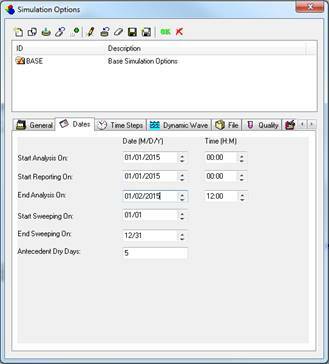 The system for this case study has already been set up for you in SWMM_CaseStudy4. Now that you have successfully loaded the model, you are ready to run the analysis. Follow the next steps to run the analysis. Click on the Map Display icon and make sure the Element Type has “Conduit” selected. Change the Data Source to “Active Output”. Choose “FLOW (Flow)” as the Data Field enter “1” in the Classes field. Make sure the color classification table has the data in Table 7.1.1 entered into it. Click on the Label Properties tab and select “Show Label” and “Show Unit”. Click “Apply” and “OK”. Now please choose the date “01/01/2002” from the Date dropdown menu on the InfoSWMM Output toolbar. On the same toolbar, choose the time “10:00” from the Time dropdown menu. Your map display should now look like the screen capture in Figure 7.1.3, with the exception of the red pipes on the left side of the figure. Those pipes will be blue in your window. 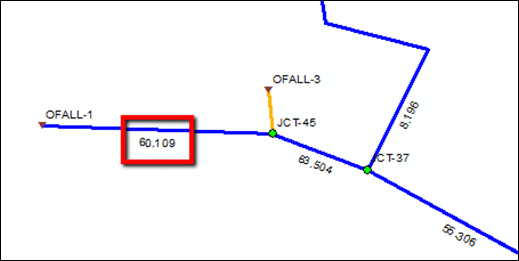 As you can see from Figure 7.1.3, the flowrates have been displayed on the map for each conduit in the system. Now that you have modeled the subcatchment’s contributions to the system, you can compare the results to field data to try to identify leaks. For the next part of this section, you will focus on the 3 pipes highlighted in red in Figure 7.1.3. For this next part of the exercise it is assumed that you have modeled your subcatchments to perfection, and that the model results for flowrate in each pipe is an accurate representation of reality (i.e., Manning’s n values are the correct true values, etc.). 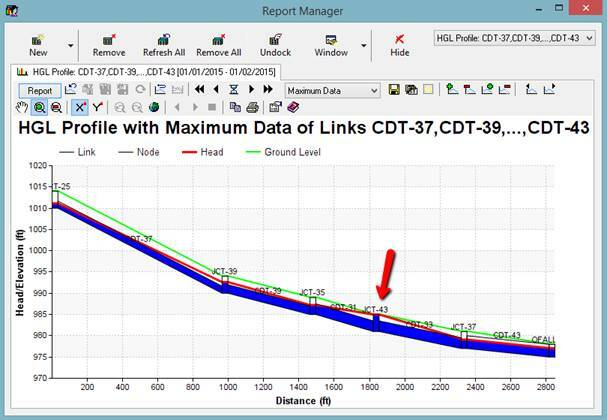 Now you can compare the model results to field data obtained from the field sensor readings. The discrepancies between data and model results are used to identify potential leaks. 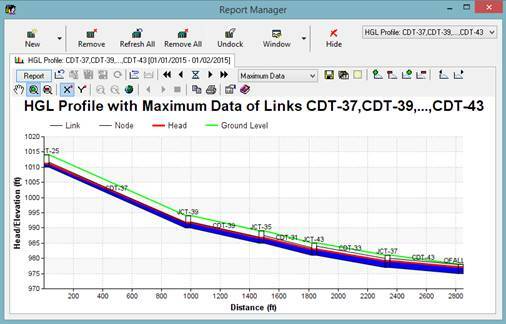 The following steps will walk you through the comparison of the model results and field data. Organize the flowrate results from the model for conduits CDT-33, CDT-41, and CDT-43 as shown in Table 7.1.2. Notice that the conduit CDT-43, which receives flow from both CDT-33 and CDT-41, has a flowrate of 63.567 cfs. This is extremely close to the sum of the inflows from two pipes. Note that minor discrepancies in the conservation of mass should not be assumed to be leaks, as the modeling is not accurate to 2 decimal places in the real world. Now you must compare the model results to the field data collected by flow sensors in the sewer system. We add the field data in a separate column to Table 7.1.2 for an easy visual comparison. This is shown in Table 7.1.3 below. 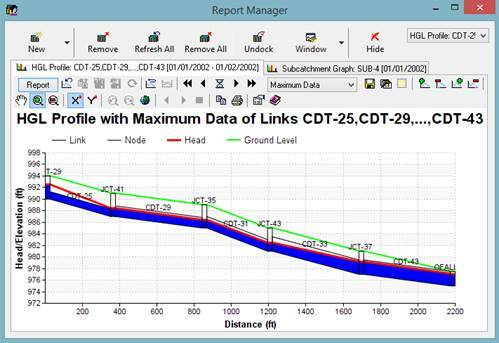 As you can see from Table 7.1.3, the field data is inconsistent with the model results for conduit CDT-43. The field data flowrate is approximately 3.5 cfs less than the modeled flowrate. Thus, you can deduce that there is an opening in the system and water is leaking from the sewer (a sink) somewhere between the two sensors. Now that the location and the type of leak have been identified, it is appropriate to model the leak until it has been repaired. Field data was compared with the model results, and you are now tweaking the model so that the results are more comparable to the field data. This is called model calibration. The following steps will walk you through the process of calibrating the model to incorporate the new found leak information. Leaks can be modeled as a simple outlet structure. This outlet structure will have a user-specified area and location to control flow leaving the system. While leaks in a pipe may be longitudinal, circumferential, etc., the areas of those leaks can be closely approximated with other outlet structures. In InfoSWMM, one of the easiest outlet structures to model is an orifice. Therefore you will model the leak in the pipe with an orifice outlet structure, approximating the leak area with the area of an orifice. Click the Add Junction icon from the Edit Network toolbar and add a junction at the bend in CDT-43 (location shown in Figure 7.2.1) by clicking on the conduit at that location. InfoSWMM will prompt you to call the junction JCT-45; just click OK. Note that this will break CDT-43 into 2 separate conduits, CDT-43 and CDT-45 (shown in Figure 7.2.1). 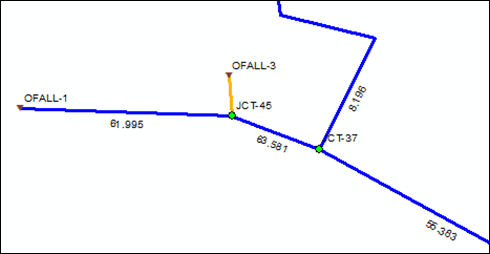 Click the Add Outfall icon in the Edit Network toolbar and add an outfall above JCT-45 (location shown in Figure 7.2.1). 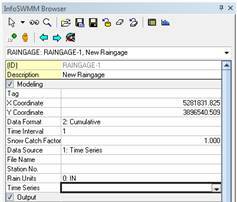 InfoSWMM will prompt you to call the outfall OFALL-3; just click OK. Note that an outfall is required to model the orifice’s connection from the junction to the ground outside of the system. Click the Add Orifice icon in the Edit Network toolbar and connect JCT-45 to OFALL-3. InfoSWMM will prompt you to call the orifice ORI-11; just click OK.The new junction, outfall and orifice are shown in Figure 7.2.1 below. Add an Invert Elevation of 976 ft and a Max Depth of 4 ft to JCT-45. Add an Invert Elevation of 976 ft to OFALL-3. Add the information in Table 7.2.1 to the attribute table for ORI-11. Click on the Map Display icon and make sure the Element Type has “Orifice” selected. Change the Data Source to “Active Output”. 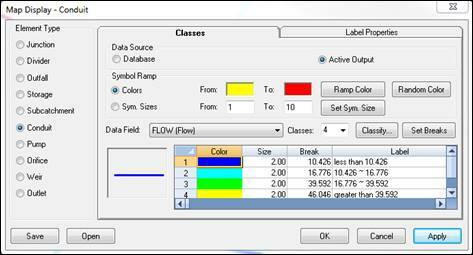 Choose “FLOW (Flow)” as the Data Field and enter “1” in the Classes field. Make sure the color classification table has the data in Table 7.2.2 entered into it. Your map display should now look like the screen capture in Figure 7.2.2. Note that the results show a flowrate of approximately 62 cfs in CDT-45, which is closer to the field data flowrate which was 60 cfs. To get the model results closer to the field data, you can adjust the size of the orifice to allow more water to leak out of the pipe. Click the Select Element icon and select ORI-11. Change the HEIGHT and WIDTH attributes from 0.5 ft to 0.75 ft. Then run the analysis again from step 6 and adjust your map display as in step 7. The map should now look like Figure 7.2.3. Note that the flow in CDT-45 is now very close to 60 cfs. Now that you have modeled the leak for this scenario successfully, you can look at other storms and other time periods to compare the model results with the field data. This will help to more accurately calibrate your model for the leak. Chow V., Maidment D., Mays L. Applied Hydrology, 1st Edition. McGraw-Hill Science/Engineering/Math, 1988. Gupta, Ram S. Hydrology and Hydraulic Systems, 3rd Edition. Wayland Press, Inc., 2008. Mays, Larry W., 1st Edition. Hydraulic Design Handbook. McGraw-Hill, 1999. Nicklow, J.W. and Boulos, P.F. Essential Water and Wastewater Calculations for Engineers and Operators, 1st edition, MWH Soft (Innovyze), Broomfield, Colorado, 2007, 372 pp. Nicklow, J.W., Boulos, P.F. and Muleta, M.K. Comprehensive Sewer Collection Systems Analysis Handbook for Engineers and Planners, 1st edition, MWH Soft (Innovyze), Broomfield, Colorado, 2004, 287 pp. Nicklow, J.W., Boulos, P.F. and Muleta, M.K. Comprehensive Urban Hydrologic Modeling Handbook for Engineers and Planners, 1st edition, MWH Soft (Innovyze), Broomfield, Colorado, 2006, 376 pp. Rossman L.A. Storm Water Management Model User’s Manual. National Risk Management Research Laboratory, US Environmental Protection Agency, 2010. Technical Release 55. Urban Hydrology for Small Watersheds. United States Department of Agriculture, Natural Resources Conservation Service, Conservation Engineering Division. June 1986. Please; Can we get Analysis and Design Workbook for 2D simulation?